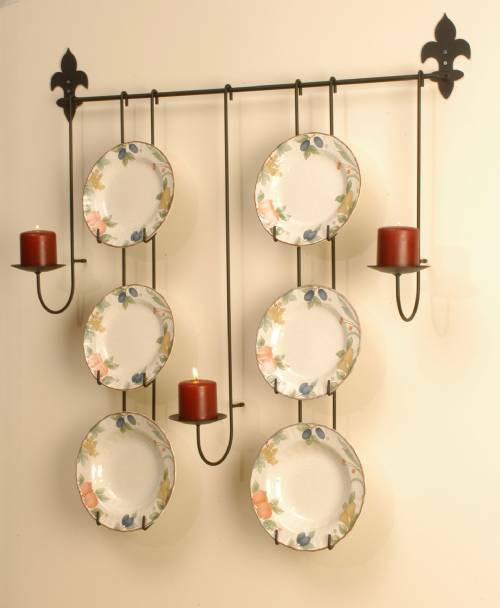 Gorgeous and unique, this wrought iron multi use plate rack also offers racks for 3 pillar candles. Plate racks accommodate plates from 10" to 11" and, like the candle holders, is removable from the base rack. Candle holders feature rubber feet to ensure the holders don't scratch the wall. Rack measures 36" wide x 34" tall, and plate brackets are 1 1/4" deep. Oversized shipping charges are included in rack price. This is a beautiful way to combine your favorite china or collector plates and your favorite candles!